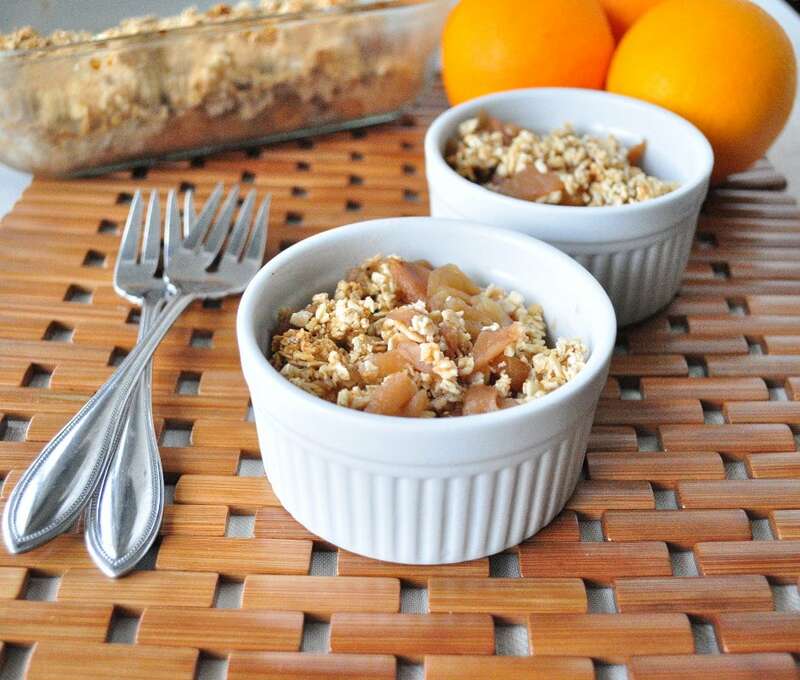 Healthy Apple Cobbler that is vegan AND gluten free. I just love fruity desserts! So I made you a healthy vegan apple cobbler. I think apple cobbler is my favorite and apple pie might be a close second. I have already created a Healthy Apple Pie. So, naturally, I had to create a healthy apple cobbler too. I hope you enjoy it this apple cobbler much as we did! I had to stop my husband from eating it all before I had the chance to photograph it. This apple cobbler recipe is so good that you and your friends would never know it was healthy, dairy free, and vegan. The secret is slow cooking the apple filling in the crock pot, the natural sugars in the apple will come out more. Another secret: adding a lot of spices like cinnamon and nutmeg will give a dish a sense of being sweeter than it is. This apple cobbler recipe is so good that you and your friends would never know it was healthy, dairy free, and vegan. Place everything in the crock pot and turn on high for the first hour and then turn to low for an additional 3 hours. Your house will smell amazing in the process! When the apples are done cooking, place them in a glass baking dish and preheat your oven to 350. I used an 8X8 dish. There will be some extra liquid left, so remove the apple mixture with a slotted spoon . Place everything in the food processor and mix until the oats start to stick together. Sprinkle oat mixture over the top of the apples and bake in the oven for about 25 minutes. I saved the leftover liquid from the filling and used it as a topping for pancakes. I actually did the apples the night before and put them in the fridge over night. I want to take this to a potluck and was hoping to serve it from the crockpot to keep it warm. Would it be possible to cook the topping separate and sprinkle it on in the crockpot? Or do you have a better suggestion? Looks delicious! Thank you! I think that could work. Let me know if you try!